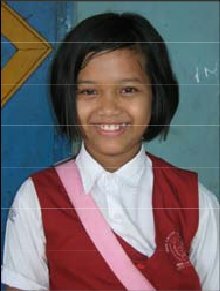 Dharma Social Projects: Projects funded by Dharma Trading Co.
Family: Risa is the youngest child in the family. Her three older siblings still attend school (10th Grade, 8th Grade and 7th Grade). Both of her parents graduated from Elementary School. Risa often suffers from cough and sore throat. Other than that, the family does not face any health problem. Education: Risa is a little shy, she does not adapt easily in a new environment. Currently, Risa is in her 5th Grade. She studies very well and scores on average 70.44 out of 100 in 10 subjects. In addition, she joins the Girl Scout every Saturday. She wants to be a University Lecturer in the future. Living Conditions/Situation: The family rents a house in a crowded and dirty area. It is located near a scavengers' site. The house is very simple, with a ground floor, ply wood walls and zinc plate roof. It only has one multipurpose room, which is used as a living room, a bedroom and a kitchen interchangeably. Their clean water source comes from a public well. The rent costs them 600,000 IDR (60 USD) per year and they spend 65,000 IDR (6.50 USD) on electricity every month. Economic Situation: Her dad works as a motorbike taxi driver. He does not earn any fixed wage. Her mom works as a maid.